Painted for Germain Lavie [d. 1781], Putney, London; by inheritance to his daughter, Emilia Lavie Lechmere [Mrs. Luther Lechmere], one of the children in the picture; by inheritance to her son, John Lechmere; by inheritance to his widow, Sophie Lechmere; by inheritance to her nephew, Charles Luther Lechmere; by inheritance to his sister, Grace Lechmere Reynolds; by inheritance to her daughter, Grace Reynolds Lewis [Mrs. Philip H. Lewis], London; (sale, Sotheby's, London, 29 June 1960, no. 46); (Frost & Reed, London); (John Nicholson Gallery, New York); purchased October 1960 by Paul Mellon, Upperville, Virginia; gift 1983 to NGA. The descent in the family was outlined by Grace Lewis in a letter of 18 August 1960 to John Nicholson Gallery, copy in NGA curatorial files. Painting in England 1700-1850, Virginia Museum of Fine Arts, Richmond, 1963, no. 236, repro., pl. 231. The medium-weight canvas is loosely plain woven; it has been lined. The ground is cream colored; it is evenly applied and of moderate thickness. The painting is executed in fairly rich and moderately opaque layers with some impasto in the highlights. The entire paint surface is significantly abraded; there are traces of overpaint throughout: a thin layer of light-colored overpaint covers much of the sky. Discrete paint loss is minimal. The natural resin varnish has discolored to a moderate degree. Praz, Mario. Conversation Pieces. London, 1971: 150, fig. 111. Egerton, Judy. British Sporting and Animal Paintings 1655-1867: The Paul Mellon Collection. London, 1978: 121-122, pl. 45. European Paintings: An Illustrated Catalogue. National Gallery of Art, Washington, 1985: 441, repro. Hayes, John. 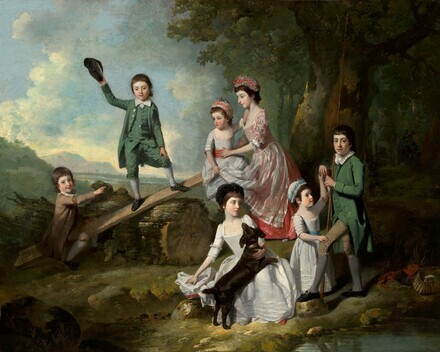 British Paintings of the Sixteenth through Nineteenth Centuries. The Collections of the National Gallery of Art Systematic Catalogue. Washington, D.C., 1992: 356-357, repro. Henderson, Anne. "Portraits & Personalities." Washington Parent (November 1997): 14-15.